Use this vanity to bring more traditional style into your bathroom. This piece comes with a beautiful brown solid wood base and a white marble counter. This classic set from Wyndham Collection will make your bathroom look brand new. Acclaim 60-inch W 6-Drawer 4-Door Vanity in Brown With Marble Top in White, 2 Basins With Mirror Use this vanity to bring more traditional style into your bathroom. This piece comes with a beautiful brown solid wood base and a white marble counter. This classic set from Wyndham Collection will make your bathroom look brand new. 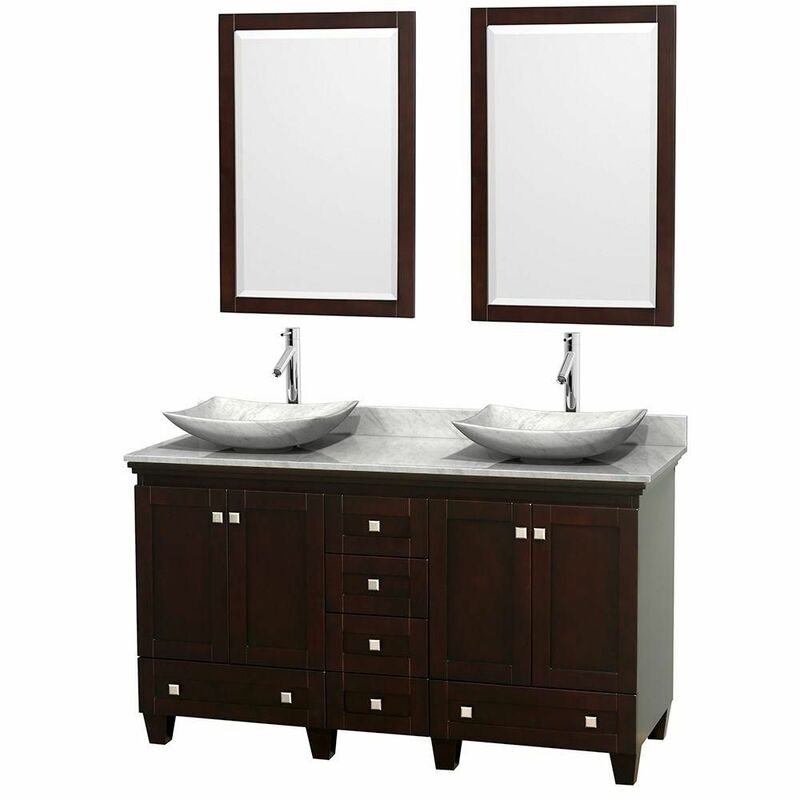 Acclaim 60-inch W 6-Drawer 4-Door Vanity in Brown With Marble Top in White, 2 Basins With Mirror is rated 4.8 out of 5 by 6. Rated 5 out of 5 by Lizett from My double vanity is pretty as expected for this price.... My double vanity is pretty as expected for this price. Elegant sink bowls. Even thought it took extra 2 weeks to get those since they didn’t come in my first shipment. Great expresso color, great quality wood vanity! Rated 5 out of 5 by Dave from This vanity is gorgeous and substantial. It came packaged in two separate containers, on a palle... This vanity is gorgeous and substantial. It came packaged in two separate containers, on a pallet. The bottom was in one box and the top and backsplash (which is separate) came in another wood box, and there was a lot of styrofoam protecting it all. It includes the sink pop-up stopper and drain assembly, which is a chrome P-Trap system, also very substantial. The finish on the vanity is a gloss gray, which barely looks like paint. It is so heavy, we will struggle getting the vanity upstairs to the master bath (so we have not installed yet, but don't anticipate any problems besides the weight). The marble is also gorgeous, and not as heavy as the vanity. This is a real statement piece for the bathroom. Rated 5 out of 5 by Scott from very nice, well made seems to be a quality vanity. Very heavy, do not attempt to install alone. Very well packaged from manufacturer. Base cabinet with separate marble top and separate sinks. The only negative was the delivery. Home Depot offered free delivery, the carrier showed up in a beat up delivery truck. They were not what i would consider professional. that said, they delivered without issue. Recommend for bathroom remodeling. Really updates the room, it's beautiful. Rated 4 out of 5 by Superconqueror from Very Nice! Very nice design, doors and drawers are self-closing making for a smooth touch. Caution...top is very heavy, definitely need two people to install. Instruction guidelines say "assembly needed", not necessary true. Overall, like the vanity combo...my client is very pleased too.